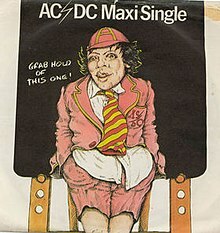 "Dirty Deeds Done Dirt Cheap" is a hard rock song by the Australian band AC/DC. Written by group members Angus Young, Malcolm Young, and Bon Scott, it was recorded for the title track of their album Dirty Deeds Done Dirt Cheap, released in September 1976. It was also released as a single – first in Australia in October 1976 with "R.I.P. (Rock in Peace)" as its B-side, and then in the UK in January 1977 as a maxi-single with "Big Balls" and "The Jack" as its B-sides. Once the Dirty Deeds album was finally released in the US in 1981 the "Dirty Deeds ..." single was released there (backed by "Highway To Hell"), where it reached number four on the then-new Top Tracks chart. The song ranked No. 24 on VH1's 40 Greatest Metal Songs and in 2009 it was named the 31st best hard rock song of all time also by VH1. Two of the services offered share names with AC/DC's first two Australian albums, T.N.T. and High Voltage. They are also the names of songs that appeared on Australia's T.N.T. and the international version of High Voltage. In 1981, Norman and Marilyn White of Libertyville, Illinois filed a $250,000 lawsuit in Lake County, Illinois Circuit Court against Atlantic Records and its distributors because, they alleged, their telephone number was included in the song, resulting in hundreds of prank phone calls. Their attorney told the Chicago Tribune that the song's 36-24-36 digits were followed by a "hey! ", which to his clients sounded like an "8", thus creating the couple's phone number. "Dirty Deeds Done Dirt Cheap (live)"
(1992) "Dirty Deeds Done Dirt Cheap (live)"
"Dirty Deeds Done Dirt Cheap" has only been included on one official AC/DC live album, 1992's Live, sung by Scott's replacement Brian Johnson. This live version was released as a single. A video clip for the single was released containing footage from the Live at Donington home video, as well as other old clips mixed in the video. This video clip was later released on the DVD Family Jewels Disc 3, as part of the 2009 box set Backtracks. An earlier version with Bon Scott, recorded live in Sydney (Haymarket) at the Festival of Sydney on 30 January 1977, was released on an Australian only radio 2JJ compilation album titled Long Live The Evolution. This live version was later released on Backtracks. In 2007 on the Plug Me In three track bonus CD from Best Buy, a live version from Detroit, Michigan, (Joe Louis Arena) 17 or 18 November 1983 was released. Joan Jett and the Blackhearts recorded the song, shortening the title to "Dirty Deeds," and included it on their LP, The Hit List, in the winter of 1990. It was released as a single and charted internationally. Bob Rivers – as "Dirty Deeds Done With Sheep"
Night Ranger – Somewhere in California (2011), which is offered by iTunes as an exclusive download along with the album. ^ Hirsley, Michael (October 10, 1981). "'Dirty Deeds' bring suit". Chicago Tribune. p. W3. ^ "AC/DC – Dirty Deeds Done Dirt Cheap". australian-charts.com. Retrieved 2010-02-27. ^ "Dirty Deeds Done Dirt Cheap". chartstats.com. Retrieved 2010-02-27. ^ "Item Display - RPM - Library and Archives Canada" (PDF). Collectionscanada.gc.ca. March 10, 1990. Retrieved 2018-02-19.